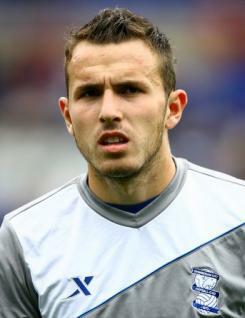 Jordon Mutch is a midfield player who was in his second year as a professional with Birmingham City in 2010-11. He is a creative player who is a good passer of the ball. Jordon signed for Blues as a schoolboy from Derby County, and signed a professional contract in May 2009. A regular in the reserves whilst still at school, he made his senior debut in the Carling Cup game with Southampton in August 2008. He gained further experience in loan spells with Hereford and Doncaster in 2009-10 and then Watford during the first half of 2010-11. His spell at Watford was a great success and he featured regularly alongside John Eustace in the centre of the park, scoring five goals during his stay. On his return to St Andrew?s Jordon was given his first taste of Premier League football against Manchester United in January and at the end of the season he received the club?s Young Player of the Year award.